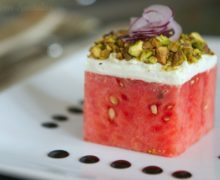 This unusual Stacked Watermelon Salad is so fun to serve at a party, and it’s easy to prepare! The diet commercials have hit the airwaves, so now we know the holidays are truly over until next year. Yes, I admit I am trying to drop a few pounds, and maybe you are too (unless you’re one of those people who somehow manages to only eat a few cookies during the holidays, skip the bread at the buffet line, and restrain yourself from going back for seconds. If you’re one of those people, you must share your secrets in the comments section because many of us are just confused about how that’s possible). One thing that I simply cannot do is follow one of those diets where all you eat is carrots and celery for two weeks. I would have so much trouble sticking to any of the super restrictive diets because they’re just so boring! Eating a little better doesn’t mean you need to pretend you don’t have tastebuds. I promise you can have interesting and tasty food, that’s a bit lighter too. When I was invited to develop a salad recipe for this month’s Kitchen Play Progressive Party, I was really excited to find out that the star ingredient was watermelon, sponsored by the National Watermelon Promotion Board. Usually when you think of watermelon salad you expect to have chunks of watermelon, cantaloupe, and honeydew together. But watermelon is wonderful when enjoyed in a savory way too. 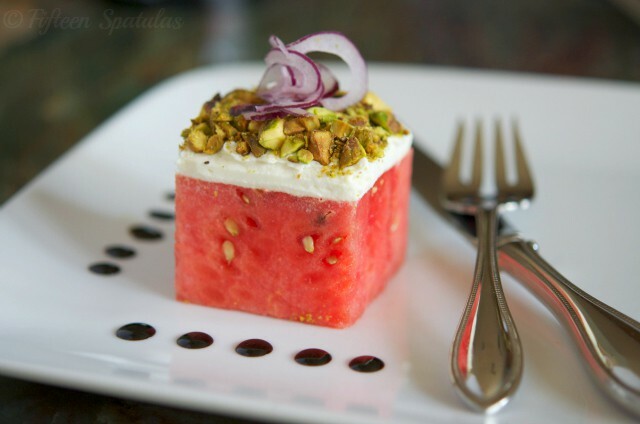 Here you take a big block of watermelon, spread the top with some goat cheese, add some pistachios for crunch, some thinly shaved red onion on top, and dip it in a little bit of a balsamic reduction. It’s on the lighter side, but it’s still delicious, fills you up without filling you out, and the presentation is a total knockout. I would definitely serve this at a nice dinner or a party. Oh, and just for simplicity’s sake, make sure to get a seedless watermelon, so it cuts really easily. The average seeded watermelon has 300 seeds, and you don’t want to spend too much time poking them all out with a chopstick (oh, the childhood memories). This unusual Stacked Watermelon Salad is so fun to serve at a party, and it's easy to prepare! 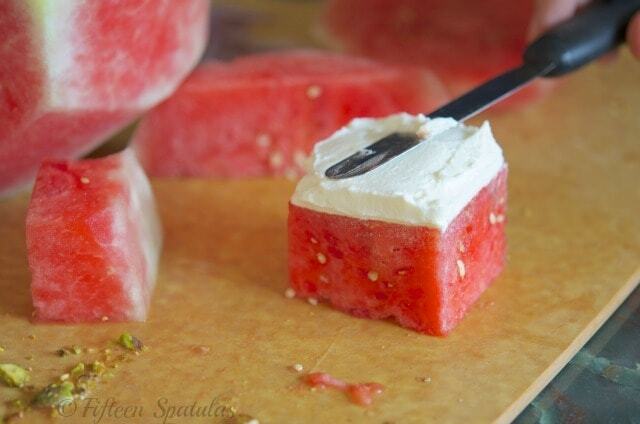 Spread the watermelon squares with a thin 1/4-inch layer of goat cheese. If the goat cheese you’re using is crumbly or difficult to spread, heat it in the microwave for 5-10 seconds and it should spread easily, like cake frosting. 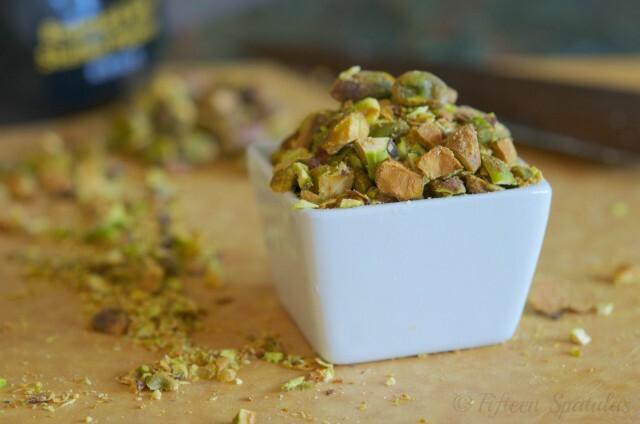 Top the goat cheese with a layer of chopped pistachios, and top that with 1/4 of the shaved red onion. Turn the balsamic vinegar into a reduction by cooking it in a saucepan set over medium high heat until it has thickened and turned syrupy. Keep your eye on it, as it reduces very slowly at first, and thickens up quickly at the end (and can burn in a matter of seconds). Drizzle the balsamic reduction over the watermelon and the plate. Serve and enjoy! Disclosure: I developed this recipe as part of the January Kitchen Play Progressive Party, sponsored by the National Watermelon Promotion Board. I love the look of this! My husband does not like host cheese at all. Can you suggest a substitute? Thanks! 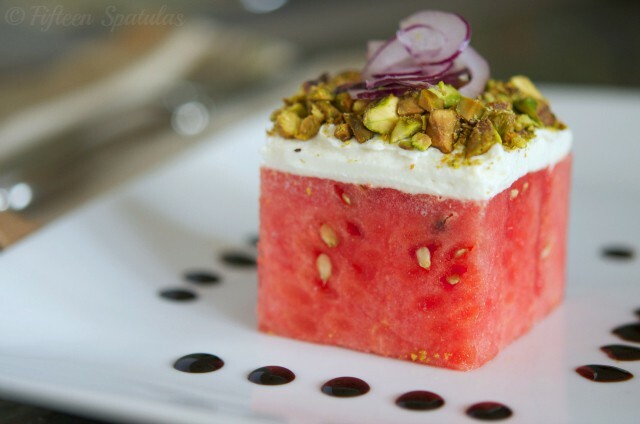 Feta is also nice with watermelon, though you’d have to turn it into a mousse to get a similar texture. very delicious recepies my suggestion plz recepies sharing option not available why? Hi! I’m just wondering how did you manage with the presentation of the dish when the watermelon gets too watery? Did you freeze it first? Your plate looks super clean I’m curious. Thankyou! Hi Ivana, no I didn’t freeze it. As long as the watermelon isn’t mushy, you shouldn’t have trouble. This looks amazing! Can you prep it ahead if time and just keep it chilled? Thanks.